We are a unique name in the industry to provide our prestigious clients an exclusive range of ABL Laminated Tubes. Specifications: Material: Plastic Sizes Available: All sizes with customised printing. In order to retain our goodwill in this industry, we are providing a latest array of Laminated Tubes. 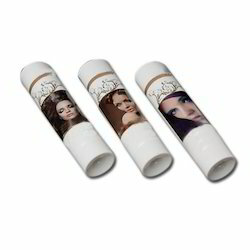 Transparent and white plastic lamitubes.Lamitubes for face wash, cosmetic creams and gel tubes. Manufacturer & Supplier of Plastic Lami Tube. Our product range also comprises of Color Plastic Packaging Tubes, Mehendi Packaging Tubes and Lip Guard Packaging Tubes. We have trusted names for offering a wide range of Mehndi Tube in bulk quantities. The SAESA®100 offers suitable output of 100 tubes a minute with minimal floor space requirement at reasonable investment. We are the manufacturer of all types of laminated tubes used in toothpaste, shaving cream, all types of skin cream, ointment etc. The laminate tubes are formed by placing the rolls of laminate material onto the needles of the machine. The material is then taken in a flat state and fed through the forming rolls, which very gently turn the tube and form it into a cylinder of variable size depending on the customer's needs. Skypack introduces laminated tubes (Lamitubes) made from state of the art Swiss Machinery adopting compression moulding for stronger fusion between shoulder and body. 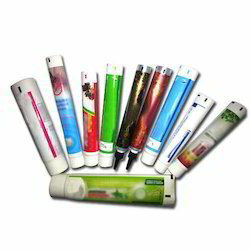 Product that requires long shelf life and safe, hygienic & attractive looks can be packed in these Plastic Laminated Tubes.